A hundred years ago horses and carts were the prime means of moving larger loads in the village. In those days the village had its own wheelwright who both made and repaired cartwheels. The cartwheels had a fairly thin metal tyre which wore out and had to be replaced. A new metal band was made just smaller than the wooden wheel, heated to red hot and then pressed over the wheel while still hot. It then was quenched with water so that it shrank and gripped the wheel tightly. 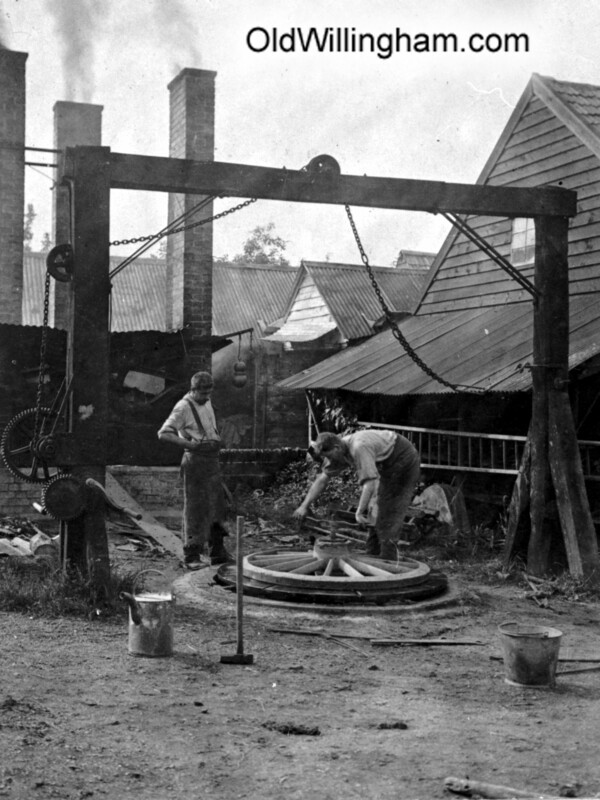 This photo show a wheel being prepared for a new tyre and you can see the smoking chimneys of the forge behind. It is believed that the wheelwright where this photo was taken lay on the east side of the village pond.